Keeping your skills current is an important part of maintaining a professional license, especially in a world of evolving technology, research advancements, expanding scopes of practice, and other emerging issues. The continuing education provided through Joel S. Duhl, Inc. will help professionals in the medical fields retain their credentialing and stay abreast of developments in specialized areas. The courses listed on this website are all offered as self-directed, online study courses. If you have any questions, please contact us at 866-444-6276 ext 501 or 502 or by e-mail at education@joelsduhlinc.com. Click here to access step-by-step instructions on how to complete a New Student Registration, or how to Purchase a Course. NOTE: AMA certificates only valid for courses completed prior to 2/1/2016. 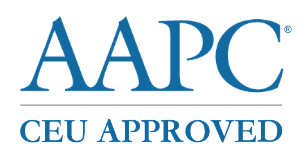 These programs have the prior approval of AAPC for continuing education hours. Granting of prior approval in no way constitutes endorsement by AAPC of the program content or the program sponsor. Please choose your license state above.